When people ask me what my favourite city in Europe is, I always feel I need to go for something obscure or a little lesser known, but it is Rome every single time. 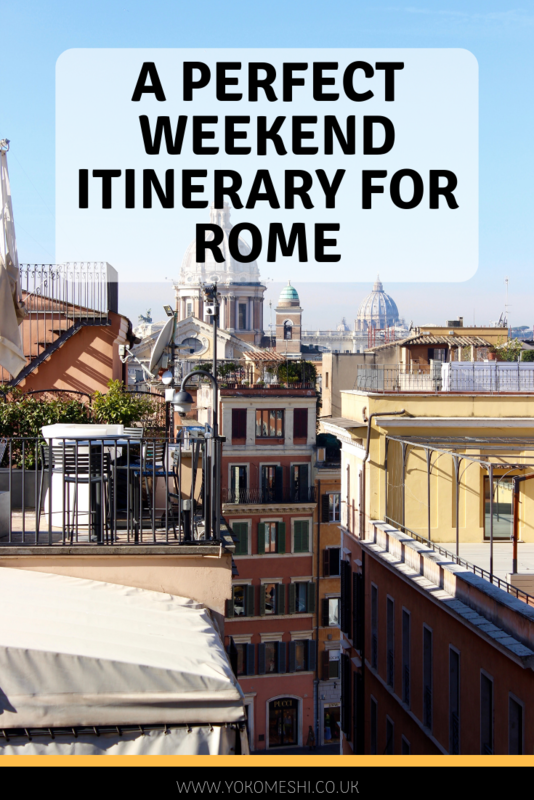 Whether you are a seasoned traveller or just like to dabble in a few odd cities breaks a weekend in Rome is a great option. At the start of this year, I headed back to Rome for two days and fell in love all over again, I have no doubt if I went back tomorrow it would be exactly the same again. With Vespa bikes zipping around every corner alongside the tall warm coloured buildings, the centre of Rome is every bit the same as it is in the movies. 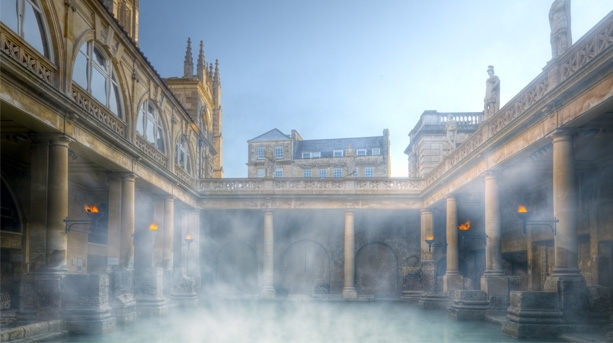 A city filled with an abundance of culture where you can spend days lost in the history. A city where food is at the focal point and will become one of the biggest highlights of your day. 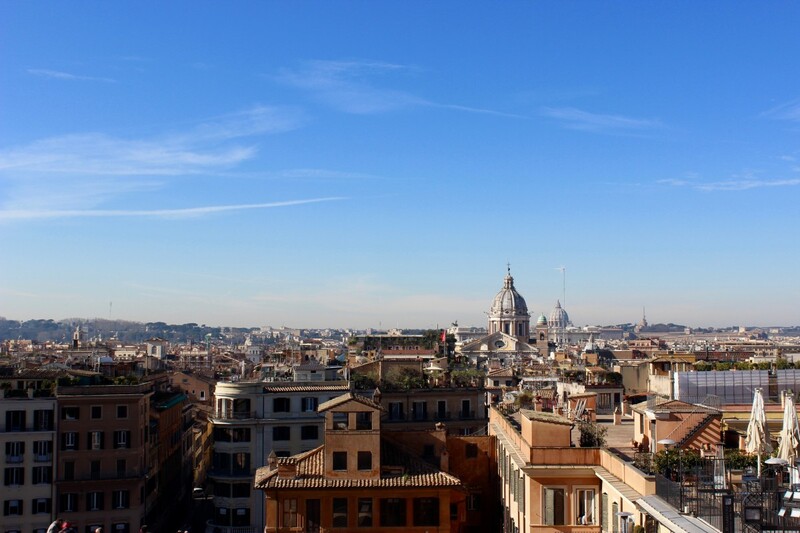 Rome is a city you can get lost in but still feel comfortable, Rome is wonderfully welcoming. 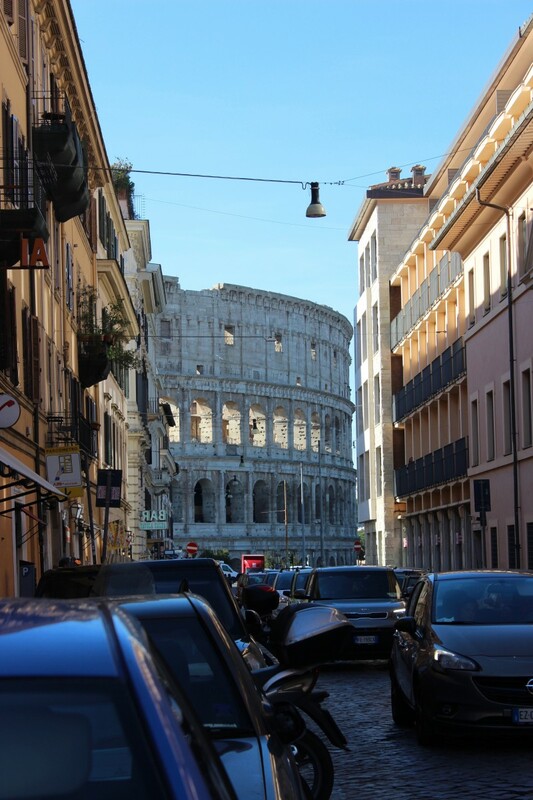 Read before you go: Top tips to know before visiting Rome – This post includes helpful tips to know before you arrive in Rome, such as how to get to the city centre from the airport, money saving tips and how to skip the queues on some of the biggest attractions such as The Vatican. Can you see Rome in two days? I personally do not believe you can ‘see’ or ‘do’ any city in two days, you will only ever be skimming the surface and pulling out the best bits. I have lived in London for thirty years and I still know there are areas I have never touched yet. That being said, for a taster of Rome, two days is a good amount. If you plan well it will be enough time to see the main attractions without having to rush and a good amount of time to sample some of the fantastic food the city has to offer. The reason Rome is such a popular weekend break destination is that it is easily accessible. 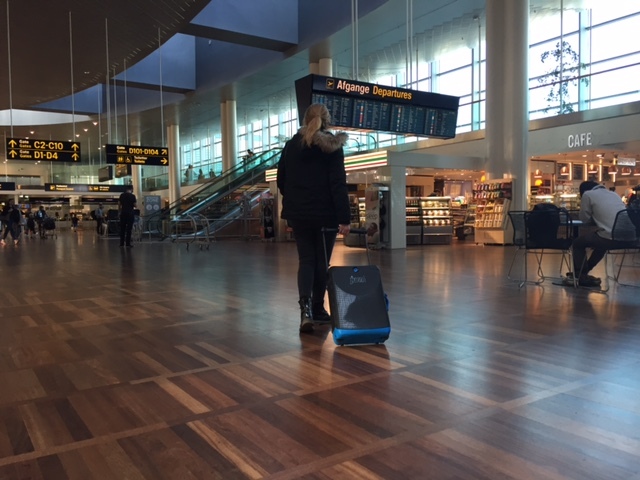 Easily accessible from other European cities by flight and getting around the city is simple due to the transportation links. On my last trip, I spent a lot of time walking around the city, however as it is the second vastest city in Europe behind London, for a short break I would opt to use public transportation for time efficiency. When visiting on a short break stay as central as possible so that you are not wasting time travelling into the city. My top accommodation tip for Rome is to stay in The RomeHello. It is classed as a hostel as it does have dorm rooms, but they also have spacious private rooms with ensuites which are as nice as hotels I have stayed in. It is affordable and extremely close to the city centre. 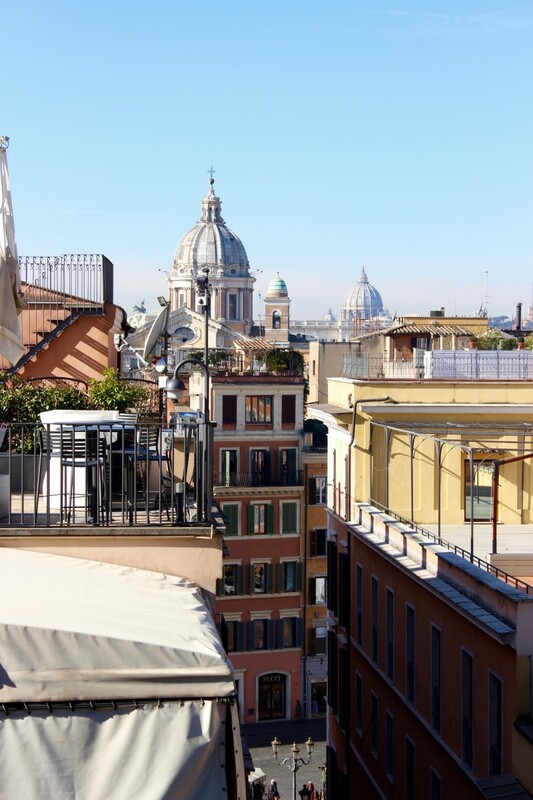 The RomeHello is a 10-minute walk from Quirinale and 0.6 miles from the Spanish Steps. The Vatican City is 2.2 miles away. If you want more information you can read my RomeHello review. If you are looking for more of a ‘party hostel’ scene while in Rome, I recommend staying at The Yellow. Again it is centrally located but it is also loud. What should I do in Rome in 2 days? As I previously mentioned there is a lot of history in Rome, so many of the main tourist attractions are centred around this. 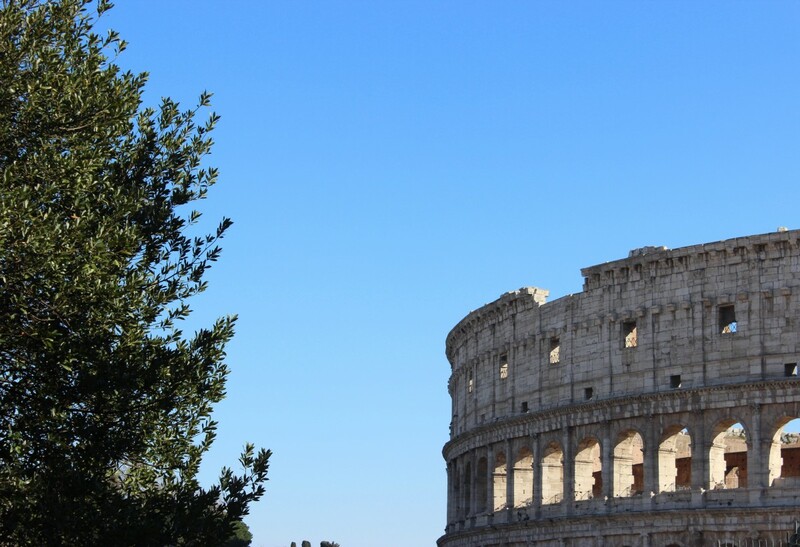 The biggest attraction is, of course, The Collosium which is situated in the centre of Rome city, it can get extremely busy so I would make this your first stop on your first morning in Rome. Arriving early will give you a good chance to beat the crowds, to save even more time I recommend purchasing a skip-the-line entrance ticket in advance. After spending a few hours inside The Collosium, next head to Palatine Hill which is located just behind. According to ancient tradition, this is the spot where Rome was born. Look down at the ruins of temples in the Imperial Forum, the centre of all political, social, and economic life in the city during the Roman Republic. You do need to purchase a ticket to gain entrance to the ruins of Palatine Hill. I have never found the queues too big when visiting here, but you can buy tickets in advance if you want to be sure. 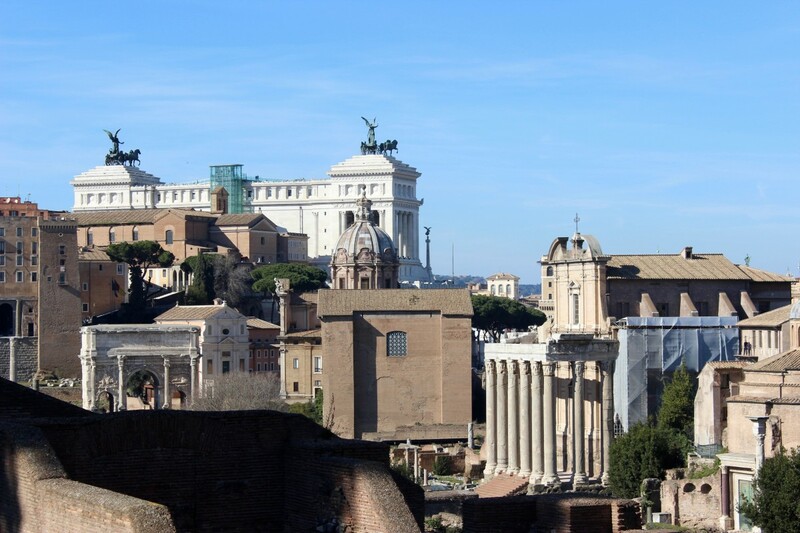 You can also purchase a skip-the-line package ticket to The Collosium, Palatine Hill and The Forum which in the long run, if you are doing all three, will save you time and money. After visiting the attractions in this area, it will be time for lunch. Normally I always advise eating away from the major tourist attractions, as the food tends to be over-priced and not too great however I found a gem right near The Collosium on ‘Via Dei Santi Quattro’ called Pizzeria Li Rioni. They serve delicious fresh and traditional style pizza and pasta for a good price. They also have tables for one, which is perfect if you are travelling solo in Rome. After lunch take a walk towards Altare Della Patria, a monument built in honour of Victor Emmanuel, the first king of a unified Italy. It is a huge building and therefore quite difficult to photograph, but if you cross over to the grass gardens opposite you can get far back enough to get a clear photo of the building in one. From here, you can move on to visit The Pantheon, a former Roman temple which is now a church. Entry into The Pantheon is free and generally, as it is free-flowing you do not generally have to queue. 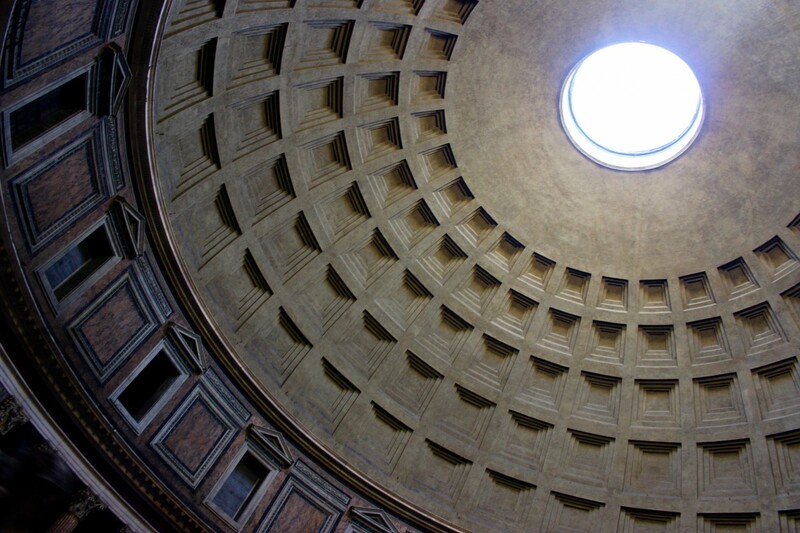 When you are in The Pantheon, be sure to look up at the open spherical ceiling. 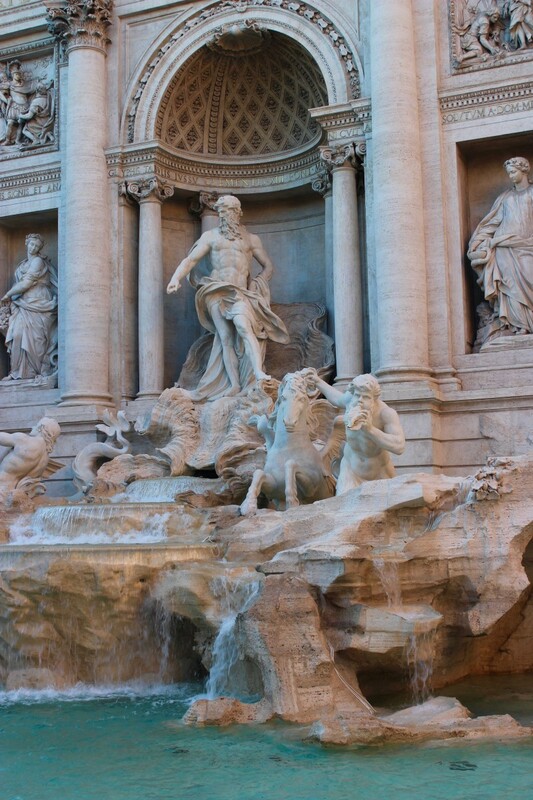 Next on your list will be The Trevi Fountain, which for me is breathtaking. However, it will be heaving with people, be sure to watch your bags as sadly pickpockets are quite rife in the crowds of this area. If you want to be able to take decent photos at the Trevi Fountains, I would recommend either visiting very early morning as unfortunately, it will be hard to get a photo without any people in it otherwise. It’s considered good luck to throw a coin into the fountain – and if you do so it’s said that you are guaranteed to return to Rome. As a result, over €2000 worth of coins are thrown into the fountain every single day, all of which is donated to charity. There are also plenty of places near the fountains to buy Gelato, but be sure you buy actual Gelato and not just ice-cream. Be sure to look out for the parlours where the Gelato is not on display, but instead hidden under metal lids – this means it was made traditionally and is fresh that very day. After grabbing a Gelato take a ten-minute walk to the Spanish Steps. The Spanish Steps lead from a fountain at the base up to a church at the top and were opened in 1725. They were made particularly famous in 1953 when the film Roman Holiday (starring Audrey Hepburn) featured them. However, my favourite tip for Rome is if you climb the steps to the very top, past the balcony where many people take their photos, across a small road there are some small steps up towards the church. Stand here to take your photos, you will get a beautiful panoramic view of the city with no heads in the way at all. If you prefer to learn more about the history of Rome while on your tour of the city a guided tour is a really good option to choose. In Rome, I recommend The Roman Guy, in particular, their Rome in half a day with electric bikes tour. This tour takes you around all the locations I have previously mentioned plus a few extra. This tour would also be a great option during the summer months where Rome can get particularly hot and therefore walking long distances may become uncomfortable. For dinner head to Mercato Centrale Roma which is located next to Termini station. I loved this place so much I visited twice in a 48 hour trip to Rome. It is essentially an indoor food market, where they have various different stands serving different food and wine. They serve a mixture of both traditional Italian food as well as various other cuisines. It is a great option if you are travelling in a larger group, as you do not have to decide on just one place to eat yet you can still all sit and eat together. I really rate the ‘Cacio e Pepe’ from here, because is there much better in life than fresh pasta and cheese? There are also various wine bars located inside Mercato Centrale if you are looking to stay out for a few drinks afterwards as well. For your next day head to a different part of Rome, The Vatican City. The Vatican City consists of The Vatican Museums, Sistine Chapel and St Peter’s Basilica, it is also its own country – the smallest country in the world! If you are staying in the centre of Rome it is a fair walk, so you may want to catch the Metro. The Rome Metro has a station just outside the Vatican walls at Ottaviano-S. Pietro. Line A of the Metro runs through with trains every few minutes. It’s a 5-minute walk from the Metro to both St Peter’s Square and the Vatican Museums. Please beware, depending on the days you are visiting you may need to switch this itinerary around. The museums of the Vatican are closed on Sundays, apart from the last Sunday of the month when admission is free- however, it tends to be very busy on that day for this reason. When visiting the Vatican ensure you dress appropriately with shoulders and legs (past knees) covered to avoid not being allowed entry. They are strict with this rule, so be sure to follow it. The Queues are generally quite long as well, especially during the peak summer seasons, therefore it is best to plan in advance by booking a skip the line tour. Inside The Vatican museums you will find over nine miles of art, if you are keen to learn more about this or easily direct yourself around, you maybe want to consider booking a guide your visit. Cameras are allowed throughout The Vatican city apart from inside the world famous Sistine Chapel. After spending a lot morning inside The Vatican City, head outside for an early afternoon aperitvio followed by another traditional Italian lunch. If you have enough time after lunch, before making your way back to the airport, I would recommend exploring one of Rome’s lesser-known areas. Trastevere is a great choice. Trastevere is the considered the bohemian area of Rome, an area which has clung to its working-class roots. In this much less crowded area of Rome, you will be able to find numerous craft beer pubs alongside colourful artisan shops. If you enjoy street art then Ostiense might be somewhere of interest to you. Ostiense is known as the residential, hipster area of Rome, where many of the walls are covered in street art murals. 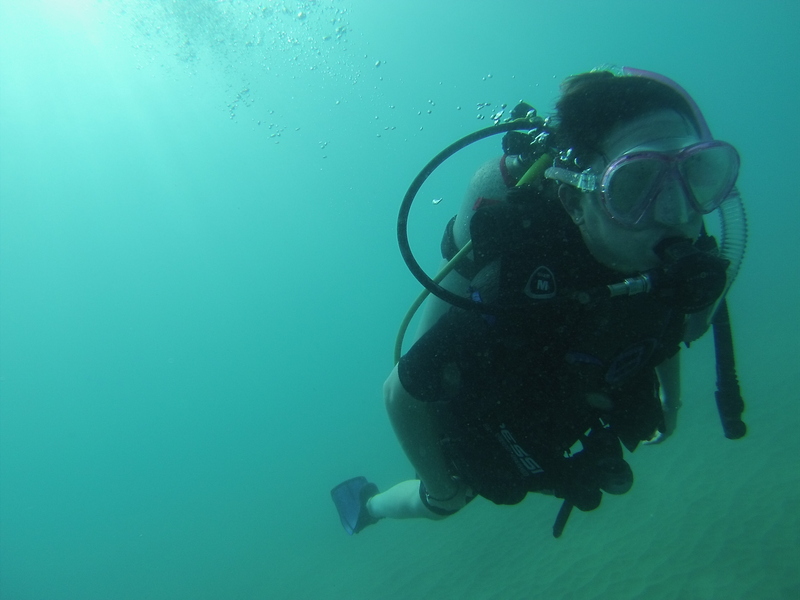 Looking for a more exciting way to see Rome? How about booking onto a Vespa sightseeing tour. Many of the scooter tours also provide a private guide option, meaning you can customise your tour for the sights you are interested in seeing. Rome is perfect for a two-day city break, it easily accessible and not big enough to be overwhelming. While you probably will not manage to see all of Rome across a short weekend break, you will be able to see a fairly large amount, and it is sure to be a city which will leave you wanting more.